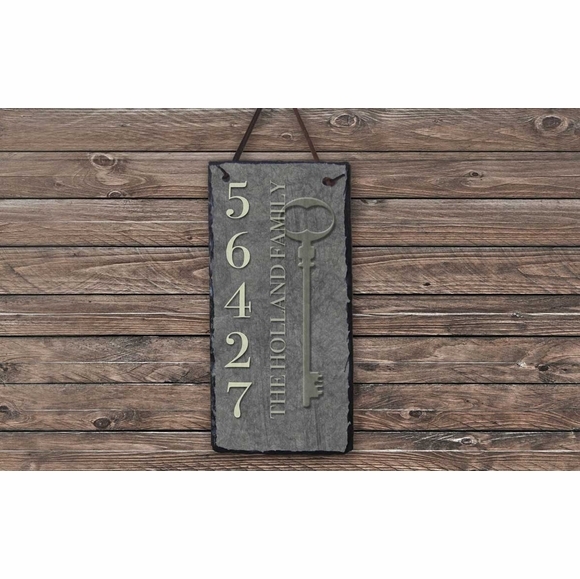 Vertical House Number Plaque with House Key - - personalized with your house number and the family name running from top to bottom. Made in USA. Features a large house key running the full length of the sign. Family name up to twenty (20) characters. Address number line runs from top to bottom and holds up to six (6) digits. Name line for either the street name or family name holds up to thirty (30) characters. Colors: slate gray with cream wording and key accent.